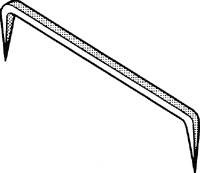 A short iron bar with ends bent at right angles. An iron pin that can be inserted in stone or timber in order to lift it. A short bar of iron with its ends bent at right angles and pointed so as to hold together the two pieces into which they are driven.